Tammy Whittaker taps on her iPad mini and opens an app that syncs to an LED scoreboard in a former Fruit of the Loom plant. 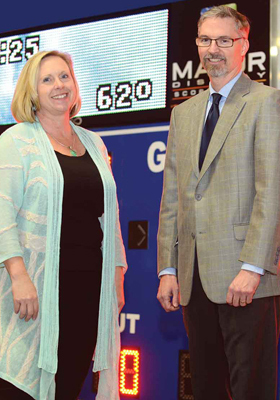 She changes the score from her iPad and the numbers light up on the board, which her company, Major Display, plans to install this spring at a new sports complex in central Florida’s Seminole County. Another app will allow spectators at and away from the games to follow the score and player stats. In early 2016, Major Display moved into the Rabun Business Park, a nearly 1 million-square-foot facility off U.S. 441 in the far tip of northeast Georgia in Rabun County. The scoreboard manufacturer and sports marketing agency generated $1 million in revenue in 2015 and expects to reach $6 million in 2016, fueled by tech innovations and clients such as municipalities, parks and recreation departments, school districts and youth athletic associations. “Our big claim to fame is that we control all of our scoreboards from a tablet or an app,” Whittaker says. In the last few years, a number of other entrepreneurs and companies with unique niches have chosen Rabun County, a county of 16,000 residents known for its natural beauty and outdoor activities. Some business owners grew up visiting the county for vacation or camp. Others see a space for plants, warehouses, restaurants and shops that’s cheaper than Atlanta, about 120 miles away, or Greenville, S.C., about 100 miles away. “Rabun County can be a low-cost, profitable place to locate a business,” says Robert Pittman, chairman of the Development Authority of Rabun County. The county’s population balloons to about 25,000 during its peak season, typically May to October, as visitors flock for outdoor recreation such as boating, hiking and biking, arts and music events, and leaf peeping. The national forest and state parks comprise 60 percent of the county, and Georgia Power, with its lakes Burton, Rabun and Seed, owns 20 percent. Beautiful as it is, that lack of private land and business amenities such as rail creates challenges in diversifying and growing the local economy. “It’s just tough on us bringing in business. Most of the people coming in are tourists,” says County Administrator Darrin Giles. Rabun’s business base is a mixture of family-run operations like the 88-year-old Reeves Hardware in downtown Clayton, which also sells furniture and even has a bridal registry, national retailers such as Walmart and The Home Depot, and beloved spots such as The Dillard House and farm stands. But leaders believe the county’s recent investment in traditional and technological infrastructure, including a high-speed fiber optic network, will draw new and expanding businesses to Rabun County. A new water treatment plant that will serve the north end of the county is expected to be finished this fall. A section of U.S. 441 from Clayton to North Carolina is slated to be widened to four lanes beginning in 2017. “That would be our last stretch of highway that would not be four-laned,” Giles says. Mountain Lakes Medical Center will replace its aging hospital with a new $25-million facility on U.S. 441 in spring 2017. CEO Joseph Forese says the challenge remains in attracting specialists – the hospital has about 300 employees, including 35 to 40 physicians. “We need to be more functional. We need to be more technological. We need to make things better and nicer for the recruitment of doctors,” he says. Rabun Business Park is an adaptive reuse of the Fruit of the Loom plant that closed in 2006. The development authority used a $16-million bond issue to buy and renovate the 971,905-square-foot facility, which it owns and manages. Now the business park has three tenants – sheet metal fabricator Gap Partners, thread manufacturer Parkdale Mills and Major Display. About 130 people work in the park, in addition to 200-plus workers at the nearby production plant Parkdale expanded in 2014. The country’s largest manufacturer of spun yarn, used in high-end sportswear, received infrastructure incentives for job growth and invested $85 million for the expansion, which created 210 new jobs. Gap Partners has about 80 full-time employees. (It received a low-interest loan from the state for job growth.) The full-service precision metal fabrication operation has improved its quality and on-time delivery and is ramping up its sales effort to grow the current customer base and add clients, says Ken Fisher, general manager. In fall 2015, Rabun’s development authority added Ryan Thornton as its economic development manager. He joins executive director Ray Coulombe, who came in 2012 after serving as economic development manager for LaGrange, and has launched a targeted marketing campaign for the business park. With 750,000 square feet of available space, the park has below-market lease rates that are based on the number of jobs, capital investment and lease term. Tax incentives also are available, and the business park is in an opportunity zone that offers a tax credit of up to $3,500 per job (based on at least two jobs per year). Target industries are advanced manufacturing, food processing and big data users, because of the new fiber available, up to 10 gigabit, in the business park. The county also is ripe for service industries employing knowledge workers, such as software, consulting and technical support, says Pittman, founder of the Janus Institute, which hosts economic development forums throughout the U.S.
Major Display simply stumbled upon the business park via Google when it was looking to expand out of its Franklin, N.C., location. Tammy and Glen Whittaker, who cofounded the company, were shocked at the deal they could get on rent in Rabun, along with the state and county incentives. Bringing in new industry is important, but tourism remains the biggest driver. “When the warm weather comes and the traffic picks up, everybody’s business picks up,” says Tony Allred, president of the Rabun County Chamber of Commerce. New and planned restaurants and retailers, especially in downtown Clayton, are creating a buzz. Diners recently packed Fortify Kitchen and Bar, a farm-to-table restaurant that opened in 2014 in downtown Clayton, as owner Jack Nolan busily mixed drinks that evening. “Downtown used to be nobody out at nighttime. Now it’s sort of revitalized itself,” says Fortify’s executive chef Jamie Allred. With farm-fresh ingredients like feta, kale and grits on the menu with foie gras and seared scallops, lunch and dinner sales at Fortify have jumped about 30 percent in the past year. “We decided to take a chance and open up a fine-dining restaurant in downtown Clayton. It’s been pretty amazing,” Allred says. In 2015, the Georgia legislature approved a resolution declaring Rabun County the Farm to Table Capital of Georgia. It’s touted on brochures, websites and other marketing materials by the Rabun County Tourism Development Authority. More chefs are making the area their home, says chair Laura Gurley. The Farm to Table designation seemed like a sign for Tyler Williams, a former chef at Atlanta’s Bacchanalia and Woodfire Grill, who had been contemplating where to open a boutique restaurant. The prospect of renting a place for $1,000, which is many times cheaper than the rent prices he was finding in Atlanta, swayed him. By this summer, he is planning to open a restaurant on U.S. 76, next to a farm that a friend of his bought. He will use the farm and land to forage for menu items like wild ramps, fiddlehead ferns and mushrooms. Atlanta establishments are interested in what’s coming out of the county as well. In 2012, retired Atlanta orthopedic surgeon Carl Fackler and his wife, Carla, opened Stonewall Creek Vineyards, which is one of four wineries in the county. Last year, the Tiger winery sold over 600 cases retail and wholesale, which is roughly double its 2014 sales. Atlanta’s Restaurant Eugene and Cherokee Town and Country Club carry its wines. But it’s not all farms and vineyards in Rabun County. The real estate market is seeing an uptick, with $51 million in total sales of homes under $1 million in 2015 and $71 million in sales of homes over $1 million, according to Georgia MLS data. The median price on Lake Burton and Lake Rabun was $1.45 million. Real estate agent Jon Barnwell says many of his clients are taking stock market profits and investing in “heirloom properties.” Inventory in the lake market has dropped and new construction has started again, he says. Developments include the luxury Waterfall Club and Heaven’s Landing, a 635-acre gated community with a private airpark 3 miles northwest of Clayton. “With a mile of runway, they can accommodate essentially any business-class jets,” Barnwell says. Visitors who are just seeking a weekend getaway instead of a real estate investment often find their “second home” at Chuck and Brenda Patterson’s The White Birch Inn and Laurel Bar. The 100-year-old renovated brick building in Clayton provides an upscale, six-room bed and breakfast for getaways and weddings, Brenda says. “Sometimes you hear about a resort or an inn before you’ve even heard of the town. We wanted to create that kind of an experience,” she says. The Laurel Bar experienced a 40 percent growth in net sales from 2014 to 2015, which shows her that Rabun County is a viable spot for people to dream big. Feeding the Hungry: A covered bridge marks the entrance to the Food Bank of Northeast Georgia’s new food hub in Rabun County. The nearly 38,000-square-foot former grocery store in a shopping center on U.S. 441 is expected to bolster the Athens-based nonprofit’s efforts to alleviate hunger and serve as an economic incubator for farmers. The city of Clayton will be the food bank’s permanent home in the mountains and could also potentially serve as a model for rural food banks, says president and CEO John Becker. The food bank began construction on the $6.4-million facility in 2015, for distribution as well as production, with flash-freezing machines, a teaching kitchen featuring local chefs, farmers and experts from Atlanta’s Cook’s Warehouse and a commercial kitchen in the future. The organization plans to use some of the fresh items it receives from Feeding America before the food perishes to create individual quick-frozen products that have no salt or sugar added. “We realized that if we could take that and convert that into a quick-frozen product, then we would have a longer shelf life on it and it would be more useful to food banks across the country,” Becker says. The flash-freezing machines have the potential to create in excess of 2,000 pounds of produce an hour, and the food hub is expecting to process 10 to 15 million pounds of produce annually by 2017. Once the nonprofit covers the 6-million-pound “meal gap” for its northeast region, the rest will be available to other food banks in Georgia. The organization also could be the first food bank in the country to help farmers preserve their produce and expand their own operations through a partnership with the University of Georgia Extension Service. Becker says farmers in Georgia and North Carolina could use the flash-freeze machines to create marketable products for restaurants and grocery stores.